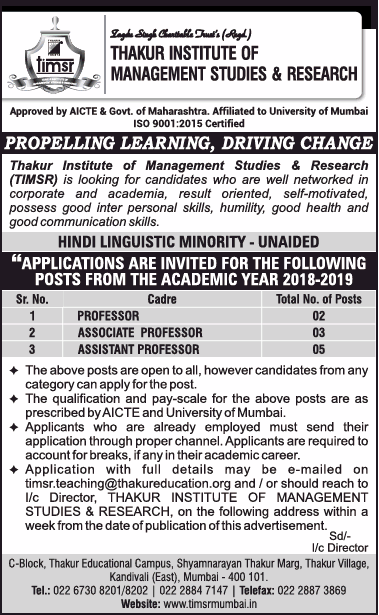 Thakur Institute of Management Studies and Research, Mumbai has advertised in THE TIMES OF INDIA newspaper for the recruitment of Teaching Faculty- Professor / Associate Professor / Assistant Professor jobs vacancies. Interested and eligible job aspirants are requested to apply within 07 days from 23rd January 2019. Check out further more details below. About College: Thakur Institute of Management Studies & Research (TIMSR) is committed to provide excellent management education with a special focus on ethical leadership and innovative entrepreneurship. TIMSR, an ISO 9001:2008 accredited institution with world class infrastructure and the best academic resources, is all set to create a new benchmark in management education.